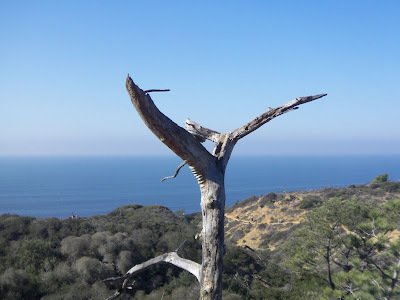 I visited Torrey Pines State Reserve this past Sunday for the first time. Hard to believe, I suppose, for folks who have lived here for a while. I have passed it numerous times and kept promising I would stop by and spend some time exploring. I had to go to Pacific Beach to lookat some property for a client so it was a perfect opportunity. If you have never been GO. If you have been well, you know what I mean. This park is extraordinary, and an amazing piece of Southern California coastline. It's quite different from scenes back east, but it did remind me of the Cape Cod National Seashore on Cape Cod about 2 hours from Boston. Preserving coastlines such as this is so important, especially when ones sees the ravages of urban sprawl and the destruction of portions of the ocast that can never be replaced. Anyhow, enough rambling. You can read more on my visit here. Or just enjoy the show. For San Diego art lovers, the Cannon Art Gallery in Carlsbad is hosting its first exhibit of the 2008 at the gallery, opening this Sunday January 20 with a reception. Read about the Cannon Art Gallery November December 2007 Show. The exhibit, "UNIVERSAL APPEAL - Memorable Portraits from National Geographic" should be a stunning show, with some very recognizable photographs (one, in particular, is a photo that is known to millions of people around the world). I'll post an article with photos of this exhibit either Sunday or Monday. Stay tuned. If you'd like to attend, the Cannon Art Gallery is located adjacent to the Carlsbad Library in South Carlsbad at 1775 Dove Lane, just a short distance north of the Alga Road/El Camino Real intersection near the La Costa Resort and Spa. 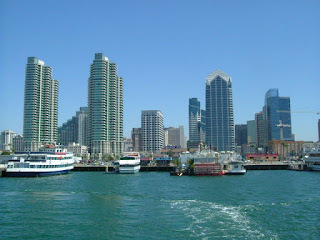 The San Diego Beat is another blog about the finest city in the world. Carole Lane, the author, loves writing about the San Diego area, and once a month there is a special edition where other blog writers in the area area included in the special edition. Here's the January 2008 Special Edition of the San Diego Beat (One of my recent articles on the LUX Art Institute was featured along with some other great information). Take a look at the posts about the art, attractions, the housing market and much more. Everyone who lives here, and many who visit, know about the marine layer. 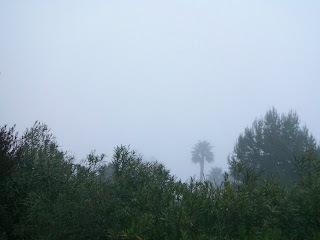 We call it May Gray and June Gloom. It's a fact of life here in sunny San Diego along the coast, and it behaves in different ways at different times. Here is my take on Carlsbad weaher and the marine layer. If you have an interest in history, especially if you live in North County San Diego, why not visit the San Dieguito Heritage Museum in Encinitas (you can read more here)? The San Dieguito Heritage Museum has new digs, located near Encinitas Boulevard on Quail Gardens Road and has a fascinating display of artifacts, photos and information about the area (San Dieguito encompasses Encinitas (Leucadia), Solana Beach, Del Mar, Cardiff and Rancho Santa Fe). There are also several historic buildings on site, an old fire engine, and early 1900s far equipment. 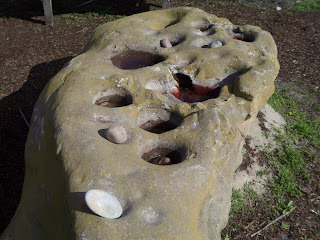 The photo is of a Native American grinding rock. I'm a big fan of art, and an art collector (not high end, mind you) and my wife and I used to own an art gallery when we lived in Cambridge, MA. So I am always on the look-out for new galleries and museums, and enjoy visiting when I have the time. The LUX Art Institute was founded in 1998 in Encinitas, but they recently opened their new facility there, which is a work of art itself. The concept is unique, too - the artist in residence - where viewers can not only enjoy the works of art that are displayed but also watch and interact with the artist at work. Artists, one at a time, live in an apartment at the institute for several weeks. 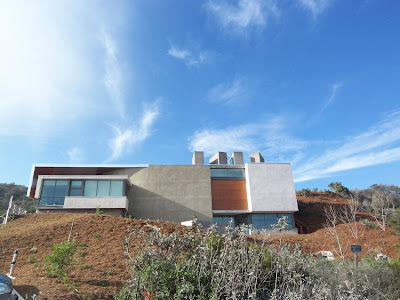 Read more about the Encinitas LUX Art Institute. I am a confessed foodie - eating out is a favorite activity of mine, whether it be lunch, dinner or brunch. Dinner on Friday night is a nice way to start the weekend, although Sunday brunch always seems sort of decadent. I remember being intrigued when I first starting visiting California and noticed the Health Department postings in the windows denoting whether the eatery was an A, B or C. I had no clue what that meant, but like most folks here now know that the ABCs of eating in San Diego are determined by the state Department of Environmental Health, based on inspections. So, it's not at all like a Zagat rating. But it's an important rating scale nonetheless. The A (90 - 100 points, substantial compliance with the law), B (80 - 89, needs improvements in structure and/or operations) and C (79 or below, which is failure - WOW, I remember in school C was average!!) signs denote the sanitation and food safety levels as determined by the most recent inspection. There are major violations, minor violations and good retail practices and these are indicated in the inspectional reports. And eateries can be closed when health hazards exist and cannot reopen until corrections are made and written permission is obtained from the department. Come to think of it, I have never been to even a B. Here's a Feng Shui Resource update from Kathryn Holt on 2008. Sounds like a great year ahead, especially for the home. I hope that you and your family had a joyous holiday season. Many people I've spoken with have been anxiously awaiting the new year, and with good reason . . . 2008 promises to be an especially auspicious (favorable) time for new beginnings and fresh starts. For starters, this is the Year of the Rat. The Rat represents the first in the long line of zodiac animals (see side bar). So as the Boar was wrapping up the previous 12-year cycle in 2007, the Rat will be ushering in a brand-new 12-year cycle. But that's not all . . . The Earth Rat has special significance because it also represents the onset of a new 60-year cycle (12 animal signs x 5 elements = 60 years). The Bottom line: 2008 will be one of the best years there is to commence new projects and endeavors, such as: buying a house, starting up a new business, getting married (or entering into a new relationship), having a baby, or whatever hopes and ambitions you may have been pondering. The trick is, do your homework. That is, be sure to take the time to plan and prepare rather than blindly rushing in. This is a year that is strongly symbolic of change. Change/transition can be seen as a challenge or an opportunity, so do your best to embrace a positive outlook wherever your path leads you . . .
Winter is the season of renewal and re-emergence, so it can be a good time to reinvent some aspect of your home or lifestyle (which also ties in with the upcoming Rat year). Space Clear and unclutter your living and working spaces so you kick off 2008 with a "clean slate"
Turn up the color: The addition of color can instantly shift the mood of an environment and how you perceive and interact with that environment, by softening what is too harsh, cooling down what is too hot, or warming up what is too cold and lifeless. Even splashes of color can be effective, such as painting your ceiling a color and leaving the surrounding walls white, or painting the trim around door and window frames to accentuate views and create flow between rooms, or paint an accent wall for a little extra pizzazz. Upcoming Classes: Next Class---Tuesday, January 8th (6:00 - 9:00 p.m.). "Celebrate the New Year." This class offers tips for setting up your home for 2008 and offers you a sneak preview of your personal forecast for the year. This class is only offered twice a year. . . Once in North County through San Dieguito Adult School and again in Coronado on Monday, February 25th. To register, contact: Doreen at San Dieguito Doreen.Walsh@sduhsd.net or Aida at Coronado Aida.Diaz@coronado.k12.ca.usi. We cannot control the uncertainity of the world, but we can control how we respond to it ~ positively, peacefully & with faith. For more information, or to speak with Kathryn directly, please contact her at 858.492.8506, or visit her website, Feng Shui Resource.